Once upon a time, my sister called me to tell me she baked something. This is much larger news if you know her than if you don’t. I applauded the effort and asked for details. 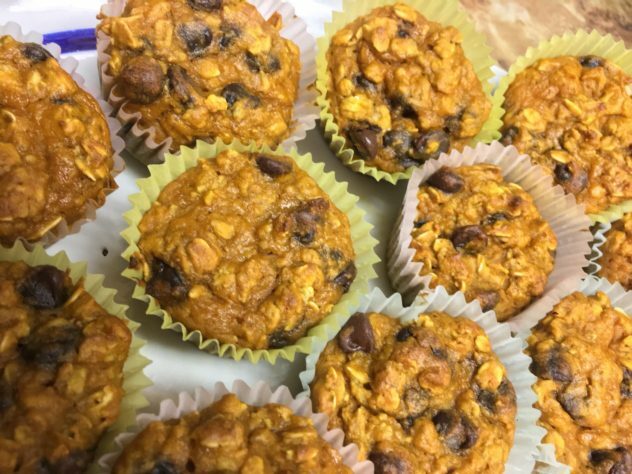 She described a moist, dense pumpkin oatmeal muffin that was lower in fat and calories and higher in protein than the average muffin. It sounded awful. I pictured this little heavy, wet lump of orange meal that tasted like spoonfuls of canned pumpkin (which I loathe). While my sister loves food and is, in reality, a solid cook, she’s not much of a baker but only because of a lack of practice. She was also on a huge “healthy alternatives” kick so she wasn’t doing her talents any favors by focusing on the more mechanical descriptors of her creation. Fortunately (or at this point, unfortunately), I was headed to her house at the time. I could see for myself what hell hath dawned via the depths of her oft-ignored oven. It turned out they were delicious. What I expected to be heavy was, in fact, dense but not in an offensive way. They were filling but didn’t take up a bunch of gut real estate (you know precisely what I mean by that). What I expected to be wet and potentially slimy was delightfully moist. 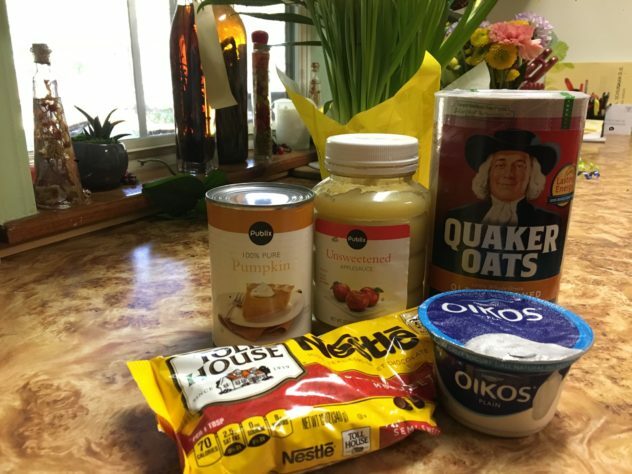 The pumpkin was present but not prominent, and the oatmeal was soft enough but maintained its integrity. The chocolate chips? Well, that was the best part. They were large dark chocolate chips that were somehow magically hard and soft at the same time. I don’t have an explanation. I am not a scientist. In the end, we ate them all. After I got home, I was still thinking about them, envisioning the little pumpkin pleasures as a nice alternative to waking up too early to make breakfast. 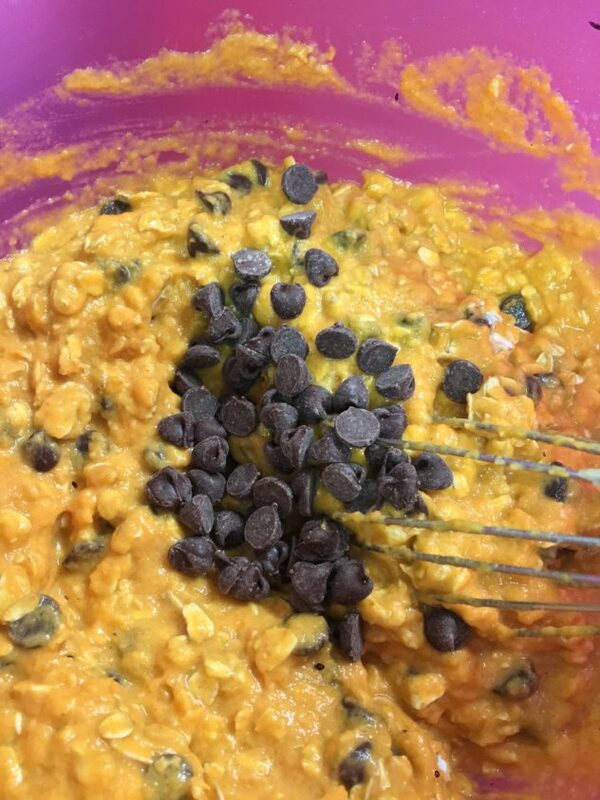 A little protein from the oatmeal, a host of health benefits from pumpkin, a portable shape, not a lot of fat…and those chocolate chips? Sounded like a perfect complement to a black coffee on the way out the door. I asked for the recipe. 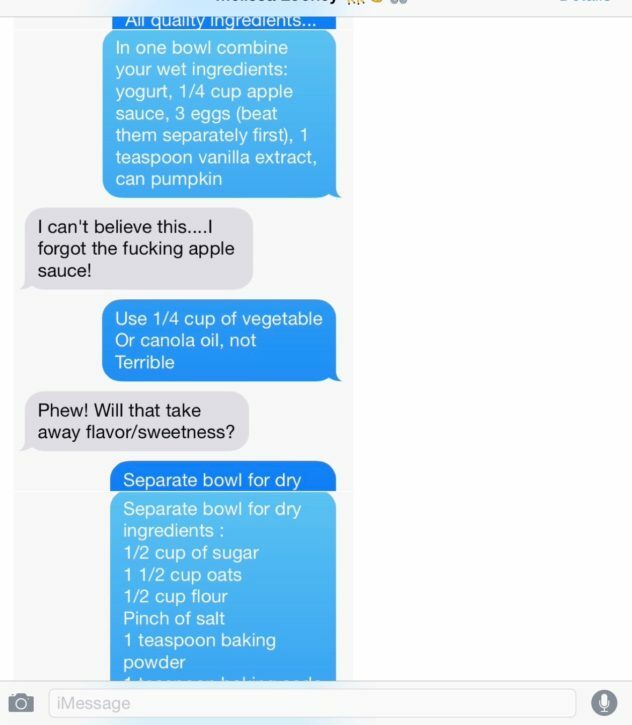 She sent me the following screenshots between her and the source of her “recipe” (please pardon the language. Also, what’s a “quacker oat?” Thanks, autocorrect). There’s no measurement for the yogurt. There’s also no indication of whether it’s Greek or not (that’s important later). There’s milk on the list but then there’s no milk in the recipe. 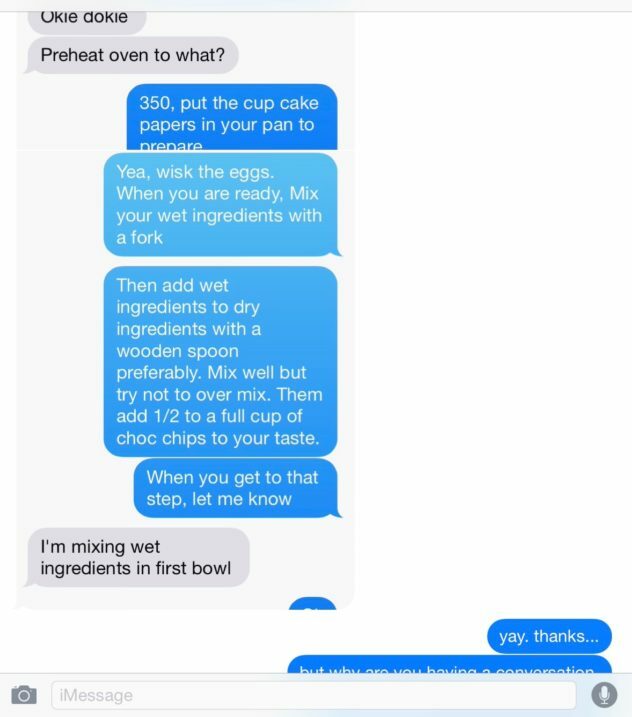 The preheat instructions come at the end of the exchange. There’s no bake time. The questions interrupt the flow of the recipe. The amount of chocolate chips is wholly negotiable. 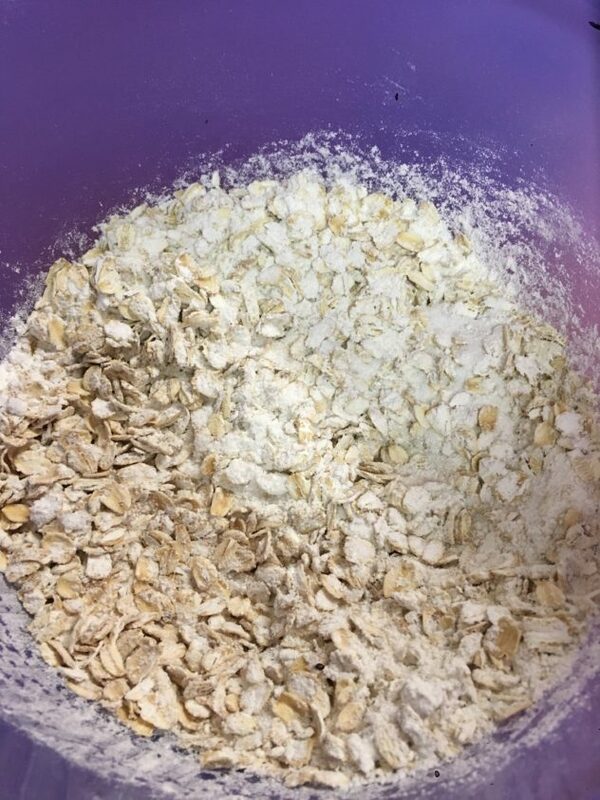 The amount of oats changes from 2 cups to a cup and a half. 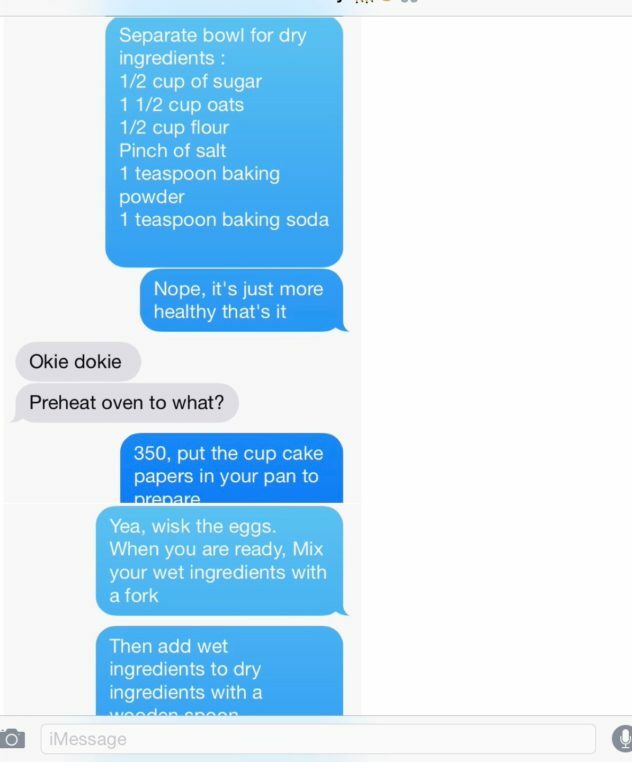 I imagined her friend in this exchange was typing madly only to be interrupted by my sister’s questions, copying and pasting the instructions after answering the questions, and losing her train of thought a few times along the way. What happened to sending a link? Hey, we all have our own processes, and the muffins my sister made were worth overcoming the confusion. It took some time, but I waded through this and somehow came away with muffins. I wondered aloud to myself repeatedly how in the world anyone came away from this with muffins. They’re so good, though. I embraced the headache. More than once, actually, and more than once, I’ve told myself I would organize this into a proper recipe. This weekend, I finally did. A little research and a bit of logic later, I’ve turned this into a full-fledged, human-grade recipe. Of course, I also made them. That name is as bad as the texts above. We’ll come back to it. Start with these lovely friends. These are also quite delicious with walnuts. If you go with walnuts, cut the chips to 1/2 cup and use a 1/2 chopped walnuts. Recipe yields 16 muffins if cups are filled and 24 if they’re not. 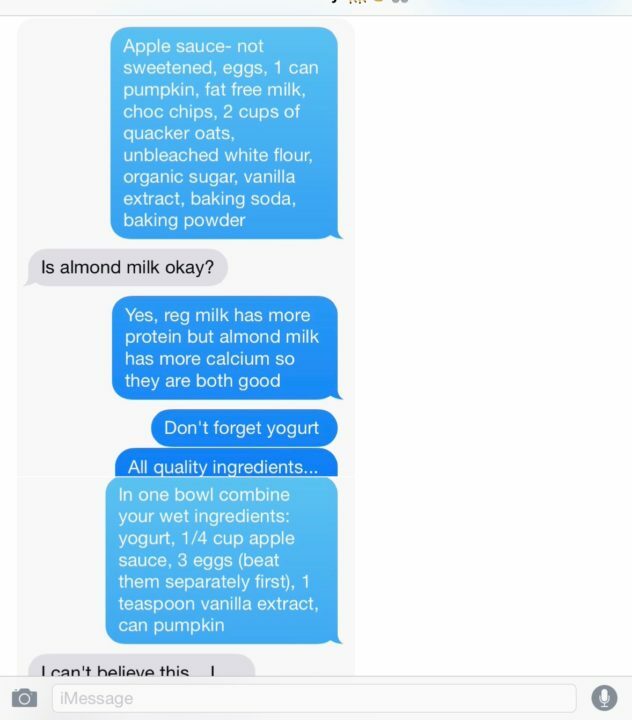 The instructions in the texts are pretty easy to follow once you figure out the ingredients (the mystery of the milk has yet to be solved…). You also will notice I went with Greek yogurt, but you can do this with regular plain yogurt, too. I noticed very little difference in taste when I did. *I had this wrong. My sister had to correct me. 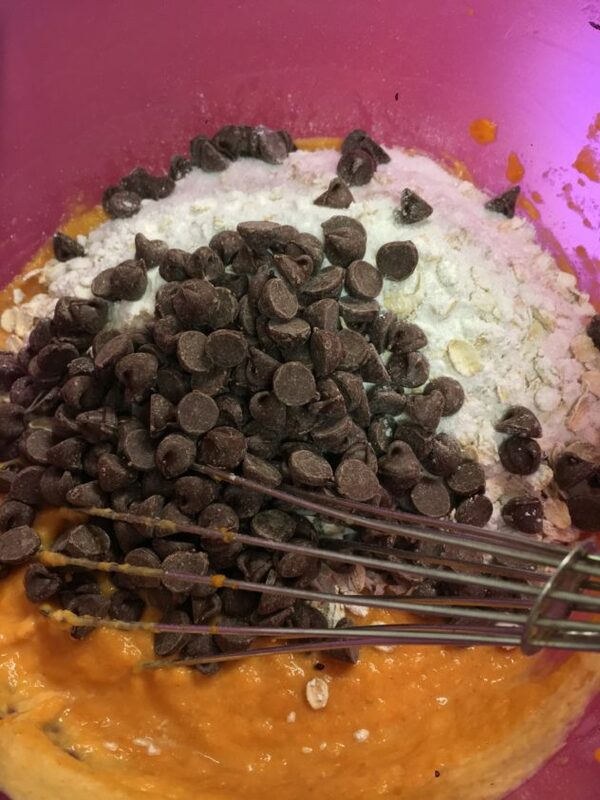 You HAVE to use dark chocolate chips. She’s correct. It makes all the difference in the world. Thanks, sis! Fill muffin pan with liners (the foil liners work best here). Beat eggs. 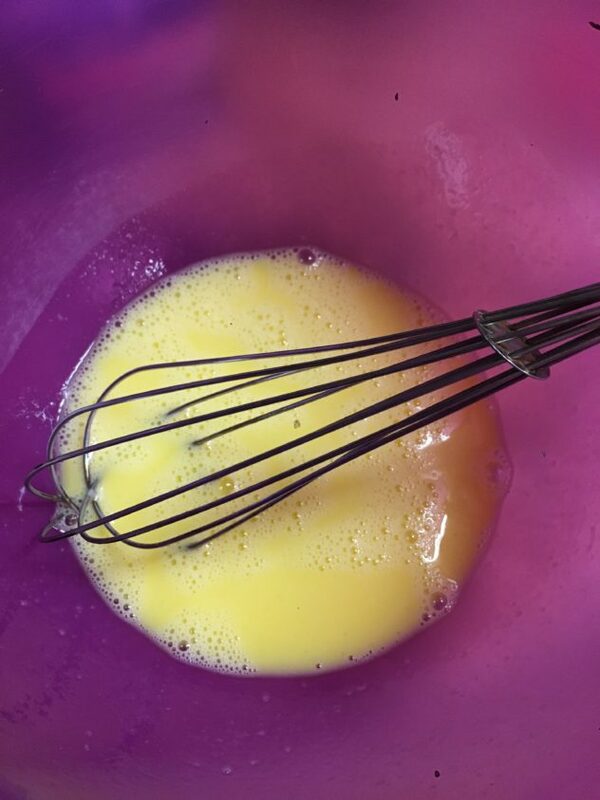 I use a whisk (as you can see). You do you. Just beat them (it?). 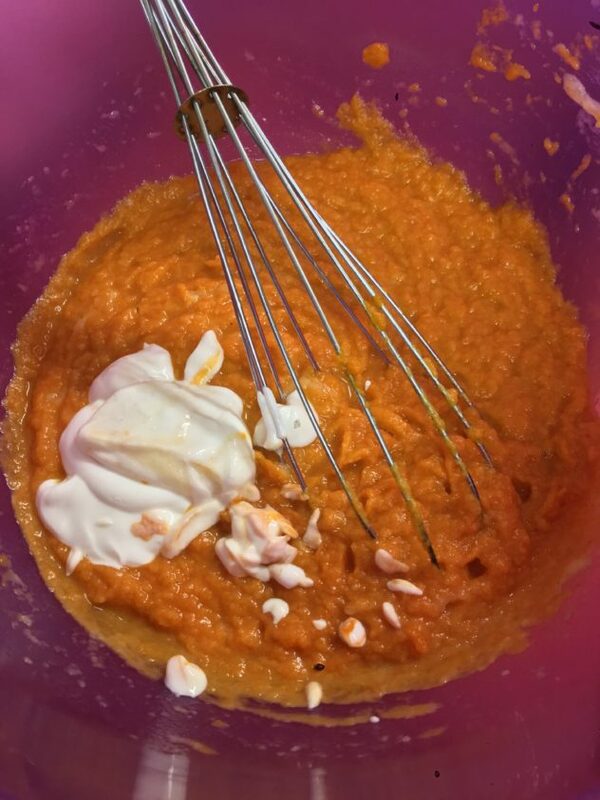 Mix yogurt, applesauce, vanilla, and pumpkin into the beaten eggs. Eggs beaten before anything else is mixed. Wet ingredients waiting to be mixed. Wait. I forgot the yogurt. Dry ingredients mixed and ready to add. 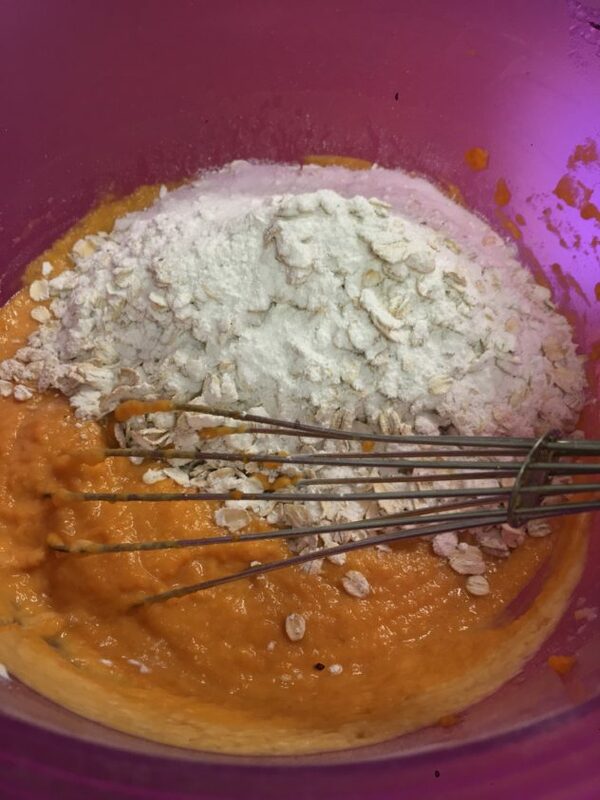 In another bowl, mix the dry ingredients: oats, flour, sugar, salt, baking powder, baking soda, chocolate chips (and/or walnuts). Add dry ingredients to wet ingredients. Mix until blended. Do not overmix. Fill the cupcake holders about 2/3 of the way. 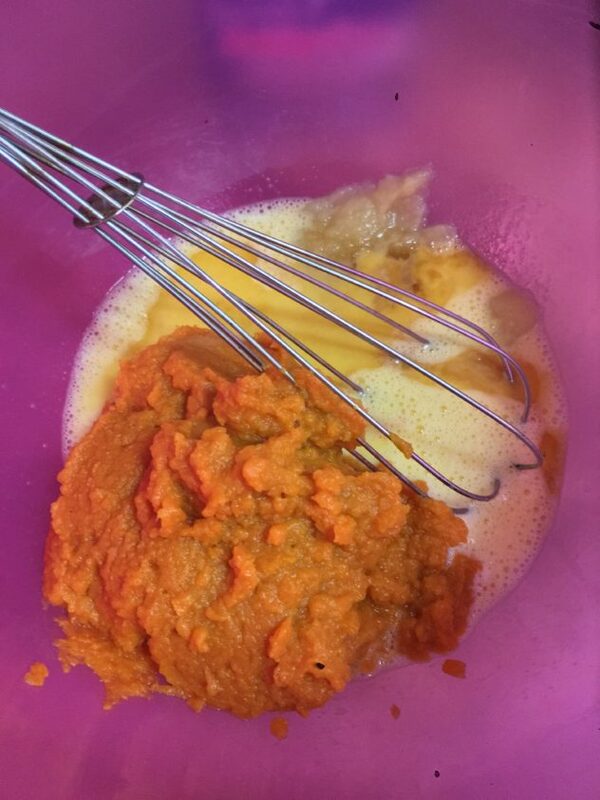 You can fill the wrappers a bit more than you usually fill cupcakes or muffins because this batter doesn’t really rise much. It does a little so you don’t want to fill them to heaping, but really, it stays pretty flat. Bake at 350 for about 20 to 25 minutes. You’ll know they’re done when a toothpick comes out NOT DRY but sort of, hm, not covered in batter. These muffins are a bit more pudding-like in texture than other muffins so if you wait until the toothpick comes out dry, you’ll have burnt or overbaked muffins that taste like dried oatmeal and bad ideas. 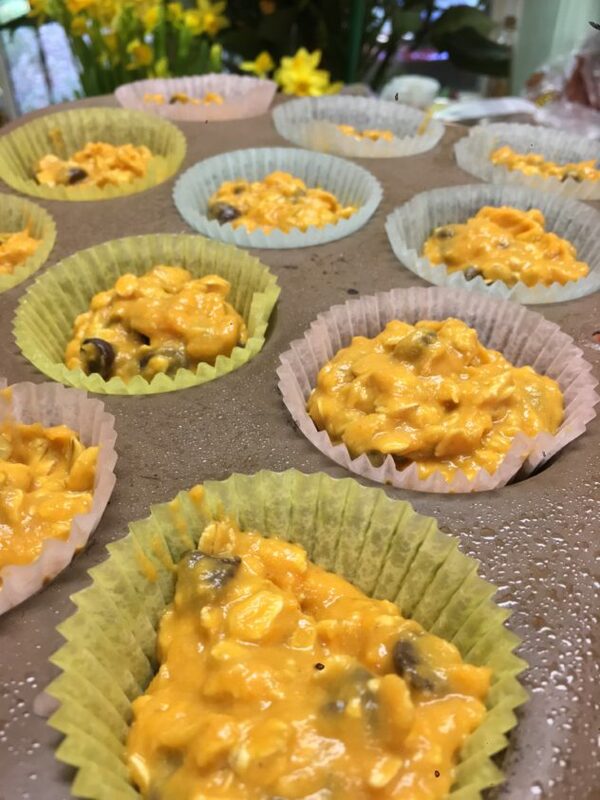 Remove the muffins, let them cool completely, stick them in the refrigerator until they’re cold, and serve. You can eat them instantly, too, but they’re not as good. Who am I kidding? More chips! You can fill these more than a regular cupcake or muffin because they don’t rise as much. I should have filled them higher, but I wanted to make the batter stretch. I wanted the whole 24. This is a pretty versatile base recipe that could be made a number of ways depending on your taste or the occasion.